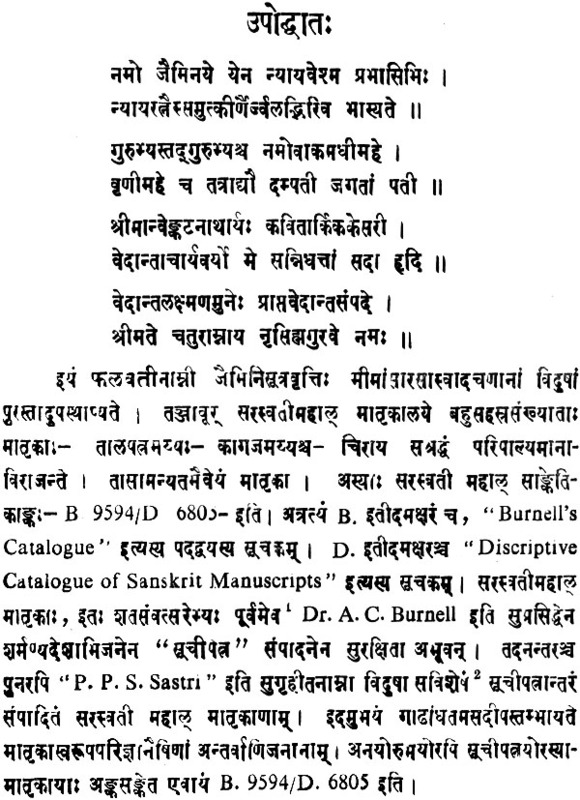 It is quite evident that the Sarasvati Mahal Library is a rich collection of rare and unique manuscripts in Oriental languages-mostly in Sanskrit. This work Jaiminiya sutravritti known as Phalavati comes under the group of unique and single manuscript series of this Library. It is unique perhaps the world also because it has not been published till now. 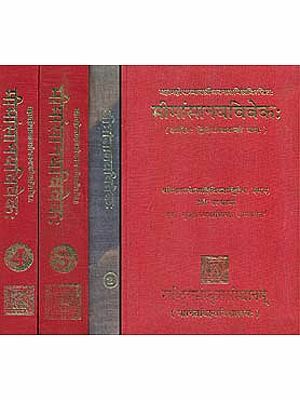 This is a work dealing with Mimamsa Sutras. Mimamsa means “a reverent study leading to a scientific quest of Truth” and it was this search after Truth, leading to the solution of the great problem of life that engaged the attention of the ancients in the past. The word Mimamsa means “profound thought or reflection”. The word is derived from the root “man”, which means “to think, know, understand”. 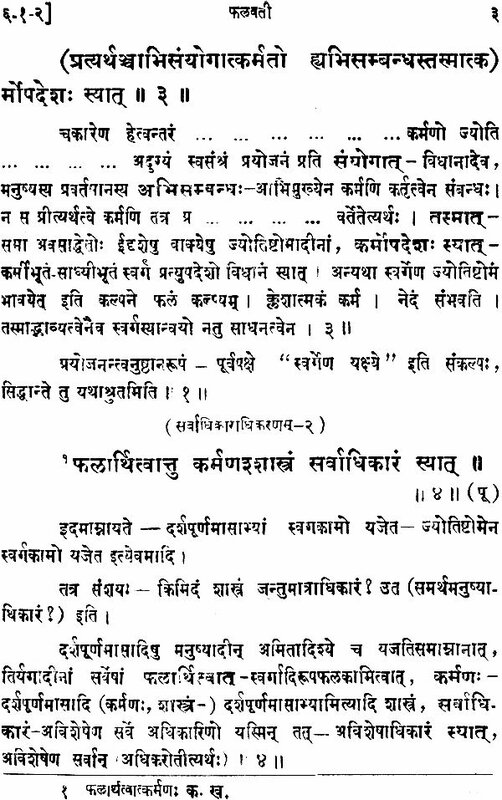 It is from this word that we get the word mansa or mind. 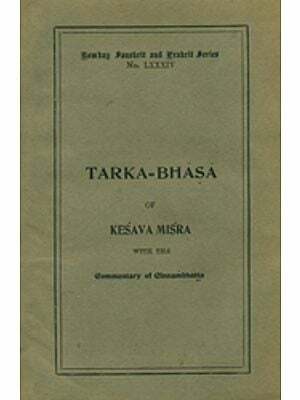 It has been divided into two classes (i. e.) Purva Mimamsa and Uttara Mimamsa. 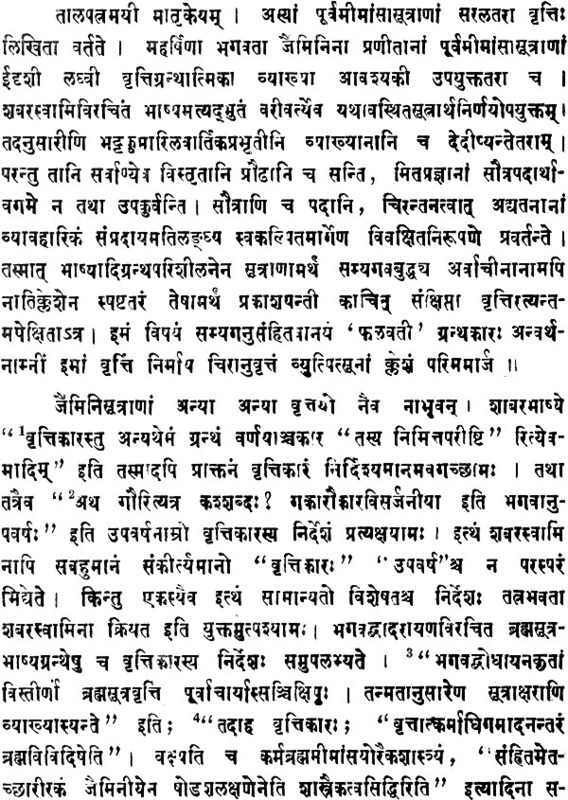 Though both have as their main thesis the elucidation of the philosophy of the Vedas they differ in this that the former restricts itself to the philosophy of ritualism whereas the latter confines itself to the philosophy of the soul. 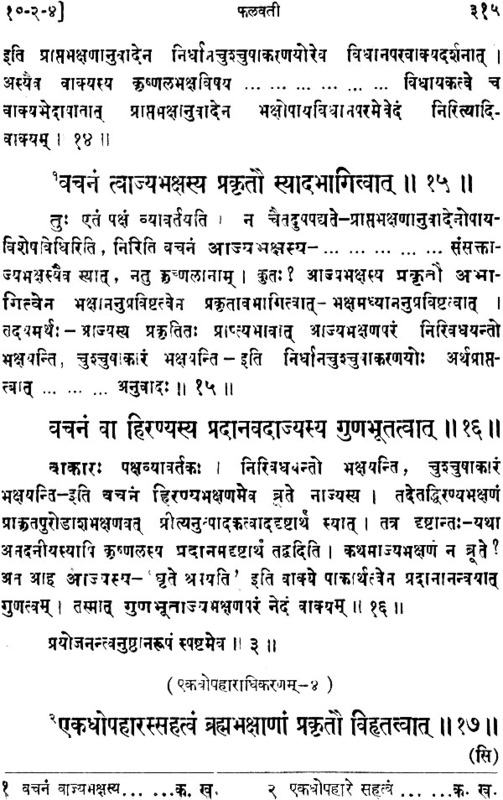 The six systems of philosophy are Sankhya, Nyaya, Vaiseshika, Mimamsa, Yoga and Vedanta. The Mimamsa occupies a most important place, not only among the six systems of Hindu philosophy but all ancient and sacred literature. 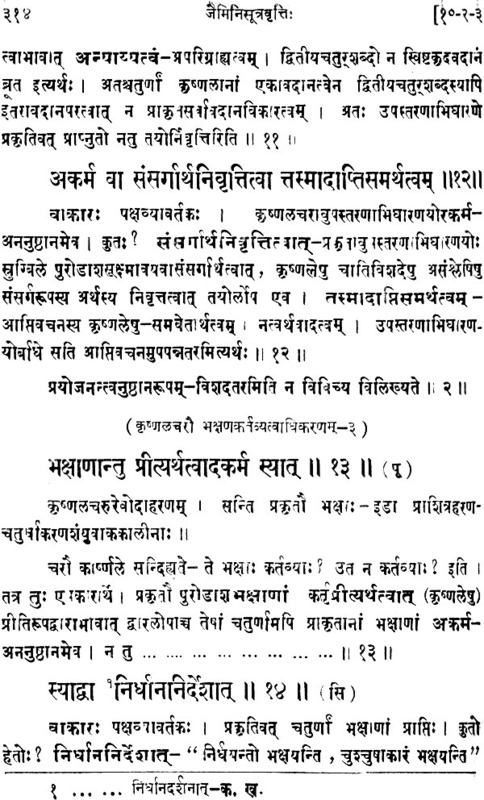 The Sage Jaimini systematised the principles of Purva- mimamsa and gave them a definite shape in the form of the extent sutras distributed over 12 chapters. This becomes clear only when the sutras are interprated in their proper perspective and no with a particular bias or pre-possession. Indeed it is this predilection of critics and commentators during several centuries in the past that has led the reader astray from the simple and direct treatment of their subject matter, and has caused so much confusion about their character. This work is incomplete in form. The author of this Vritti on the sutras of Jaimini is not known. That he may be Upavarsa is the fond hope of Dr. A. C. Burnell, the German scholar in Sanskrit, who classified and indexed the Tanjore Palace Sanskrit manuscripts in three volumes in the year 1879. 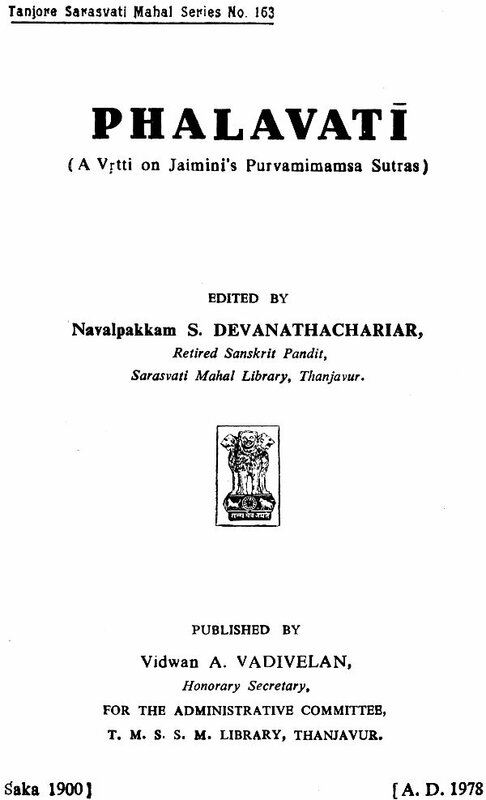 We thank the learned editor and formerly Sanskrit Pandit of our Library Thiru N. S. Devanathachariar, Siromani, for the great pains taken by him in shaping this volume into a useful edition for the benefit of scholars. His method of approach for shaping this very old brittle manuscript into a beautiful edition is highly commendable. We are thankful to our Assistant Librarian Thiru M. Seeralan, B. A. who has spared on pains in the release of this work. Our thanks are due to Messrs. Sri Vani Vilas Syndicate Limited, Srirangam, for their neat execution of the printing work. 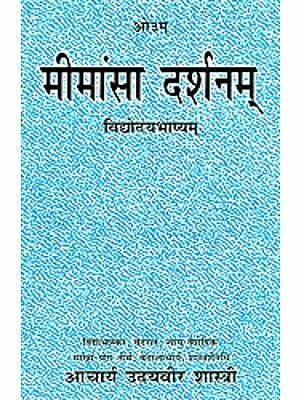 The Government of India came forward to meet full editorial remuneration and half of the remaining expenses in publishing this rare manuscript. 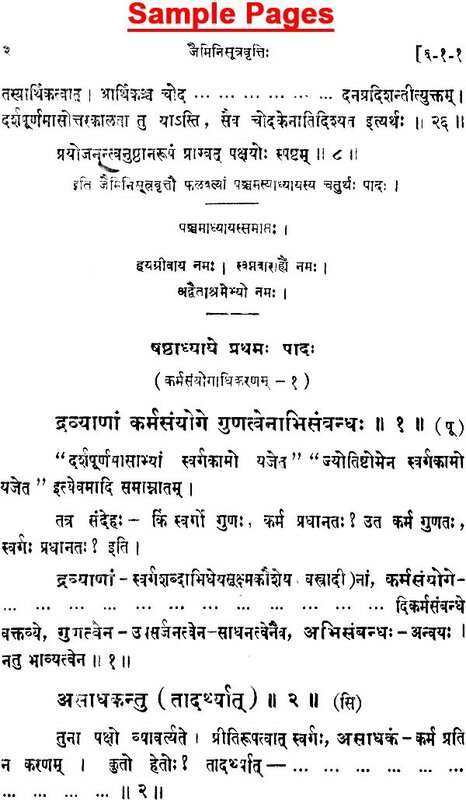 On this encouragement the Library came forward with enthusiasm for publishing to this manuscript. This encouragement was really very useful to this Library. We pay our humble thanks for this great help to the Government of India.